Life imitated art as actors Song Joong-ki and Song Hye-kyo, who starred as romantic leads in the hit drama series “Descendants of the Sun,” married in a private ceremony in Seoul on Tuesday. 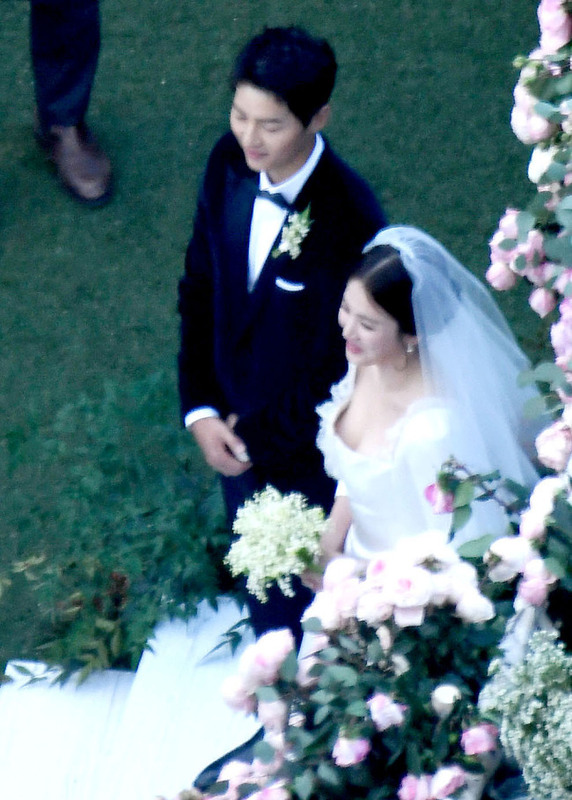 Drone camera photos taken by Chinese media outlets showed groom Song Joong-ki in a black tuxedo and bride Song Hye-kyo in a white dress with a squared neckline. The ceremony took place with some 300 invited guests, consisting of family and friends, amid strict security. The area around Song’s wedding venue, The Shilla Seoul’s Yeong Bin Gwan, a Korean-style banquet annex, was swarming with press and fans Tuesday afternoon. However, no press conference or photo op for the media took place. Security personnel guarded entrances to the annex from early Tuesday morning, while preparations were in full swing inside the annex courtyard for the outdoor ceremony. When guests began arriving at around 3 p.m., security guards checked each person’s invitation and the guest list before allowing them entry. Chinese actress Zhang Ziyi, who starred alongside Song Hye-kyo in Wong Kar-wai’s “The Grandmaster” (2013) and John Woo’s “The Crossing” (2014), was among the first of the celebrity guests to arrive, at around 3:10 p.m.
Actress Kim Ji-won, who starred in “Descendants,” and actor Hwang jung-min followed, arriving at 3:25 p.m.
Actor Yoo Ah-in, a close friend of Song Hye-kyo, and Kim Jong-kook, who starred with Song Joong-ki in the popular variety show “Running Man,” arrived at around 3:45 p.m. Actors Park Bo-gum, Lee Jung-jae, Kim Hee-sun, Lee Jung-hyun, Moon So-ri and her husband, director Jang Joon-hwan, followed. Comedian Kim Je-dong, Super Junior’s Donghae and SHINee’s Minho attended as well. Other cast members of “Running Man,” including Yoo Jae-suk, Haha, Ji Seok-jin and Lee Kwang-soo were also present. Park Bo-gum was invited to give a piano performance, while close friends Lee Kwang-soo and Yoo Ah-in were invited to read letters to the couple. Reports had said earlier that the ceremony would not have a wedding officiant, but a friend from Song Joong-ki’s school days would be hosting the ceremony. Singer-turned-musical actress Ock Joo-hyun, Song Hye-kyo’s close friend, sang “A Whole New World,” from 1992 Disney animation “Aladdin,” for the couple, reports added. Meanwhile, Chinese media outlets released clips and photos of the private wedding ceremony via Chinese social networking site Weibo. The clips showed the bride and groom smiling, kissing and hugging each other’s family during the ceremony. 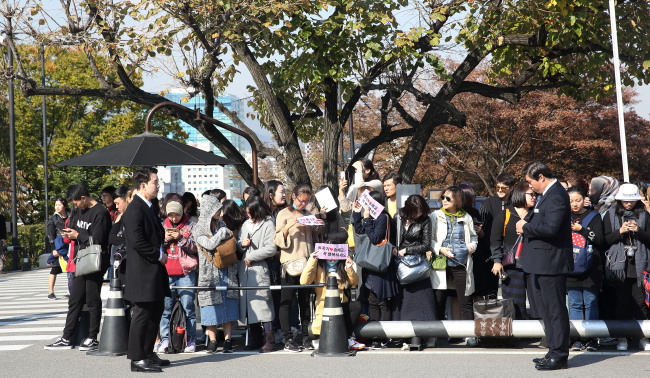 International fans from Asian countries holding signs bearing the Song couple’s names and other travelers had begun to gather at the parking lot outside the annex as early as noon. Some were in the area by chance, while others had arranged to visit Korea specifically for the wedding. 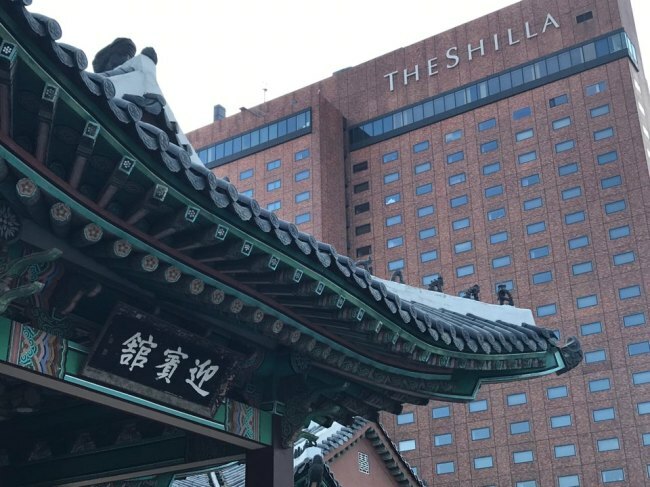 “We’re traveling and happen to be staying at The Shilla,” said Liu Xiaoxia, 24, a travel agent from China. “But I’m a fan of Song Joong-ki and Song Hye-kyo. ‘Descendants of the Sun’ was very popular in China,” she said. A bank employee from the Philippines said she had decided to drop by while on a visit to Seoul. Atsuko Koizumi, 51, and her daughter Ari, 19, from Japan, said they had arranged their trip to coincide with the Songs’ wedding. The couple will not leave straight away for their honeymoon in Europe, according to Song Joong-ki’s agency Blossom Entertainment. The couple will likely settle down at a 602-square-meter home in Itaewon, Seoul, which Song Joong-ki bought for 10 billion won ($8.9 million) in January, according to reports. The two actors announced their engagement in July, having met while shooting the hit series “Descendants of the Sun,” which ran from February to April 2016. Song Hye-kyo, 35, gained popularity through lead roles in TV dramas “Autumn in My Heart” (2000) and “Full House” (2014). Song Joong-ki, 32, starred in TV series such as “Sungkyunkwan Scandal” (2010) and films “A Werewolf Boy” (2012) and “The Battleship Island” (2017).